Spaced out. After 5+ hours of driving we arrive in the Mojave Desert, engulfed by the stars. With camp set at the base of a dormant volcano we gather around the campfire, joking & story-telling through the wee hours of the night. 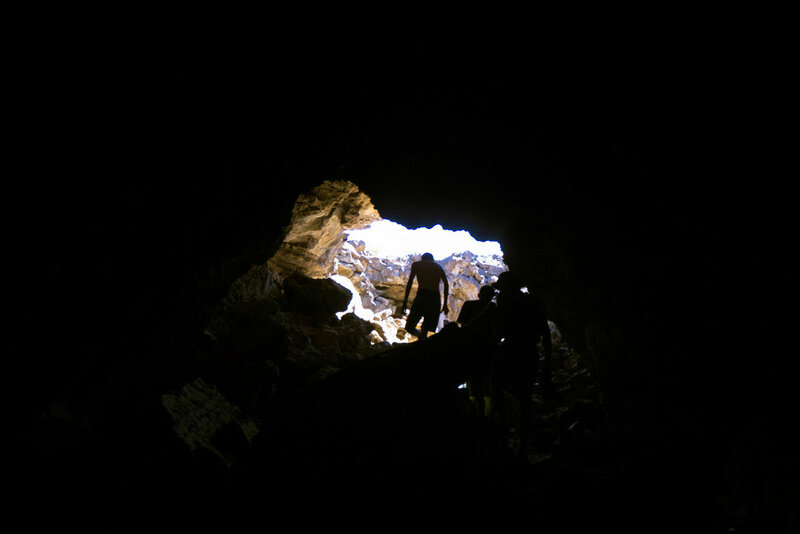 Searching for lava tubes as we scramble over ancient lava flow. Made it to the underworld! At 30 degrees cooler, the lava tubes offer a safe haven from the scorching desert sun. 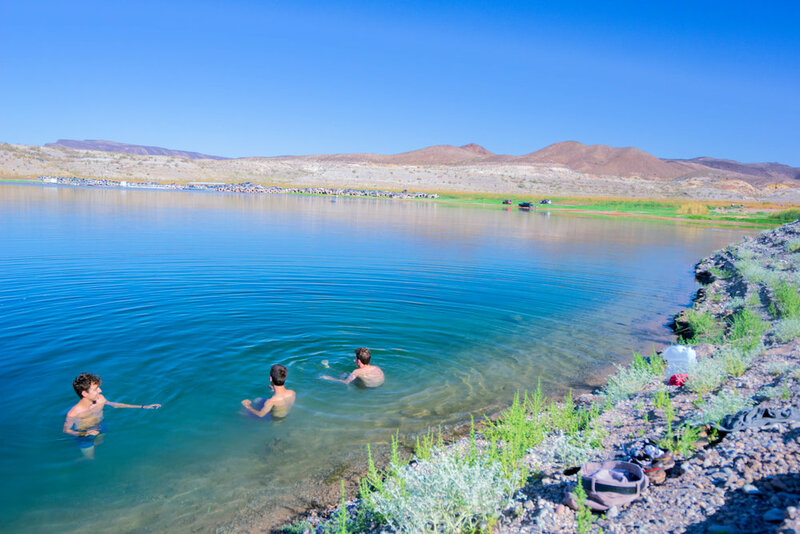 105 degree temps inspire us to seek out a swimming hole..... & that a'int easy in the Mojave. After crossing the CA-NV border we arrive at the waters of Lake Mead. Temperatures rose from 105 to 115; the lake only provided a temporary escape. 20 miles of off-roading through the canyons (hopefully) leading to another section of Mead. Boulders needed to be moved & passengers had to guide drivers through narrow passes. We survive the 20 miles of brutal canyon driving & land at the shore only to have one of our cars get stuck in the mud! Grabbing what little wood there was, we attempt to bail the truck out. No dice. At 115 degrees, heat exhaustion starts to take effect. The shade of Sputnik, cool mud, & view seem to make it all worth it. After several failed attempts to find help, half of the crew harbors down & take their mind off of our plight. At 11 p.m. temperatures still exceeded 100 degrees. Sleeping? Naw, in this heat stargazing & some of the Devil's Lettuce appear to be our only hope. Hours pass before temperatures cool. Mornin' Camper. Dug out the mud while we attempt to find someone capable (& crazy) enough to drive down a 20 mi canyon wash to rescue us. Finally found the crazy guy we were looking for! Covered in mud & with 2 hours to kill, taking a dip is the obvious decision. Soaking in the full magnitude of the journey before a F350 bails out the Chevy. Not a bad place to get stuck in all honesty; it could have been far worse, but it was actually kinda fun. Tow in hitch! After another hour of digging & multiple failed attempts the F350 bails us out of the mud! We're saved. Sound like a misadventure?